Clean all wheels with speed and precision! The Speed Master Wheel Brush is the most advanced wheel detailing brush today! Built for quick, effective cleaning of all wheels, the Speed Master Wheel Brush has a state-of-the-art design that cleans any wheel surface and any wheel design – without scratching! Brake dust beware! There’s nowhere to hide from the Speed Master Wheel Brush. Regular, thorough wheel cleaning is imperative for all vehicles. Brake dust is highly corrosive to wheel finishes, and it is generated each and every time you apply the brakes. Brake dust is made of brake pad dust and red hot metal filings from the rotor. This volatile mixture eats through protective wheel finishes and pits the metal, permanently eliminating that bright metallic shine. The braking systems in many vehicles generate a lot of brake dust. Coincidentally, these vehicles often have the expensive alloy wheels with intricate spoke designs. 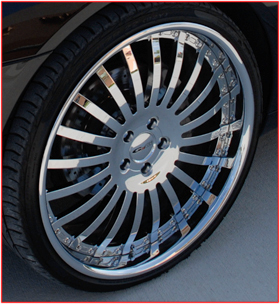 These wheels look unbelievable when they’re clean, but how are you going to keep them clean? The Speed Master Wheel Brush easily cleans all intricate wheel designs. The Speed Master Wheel Brush. This advanced wheel brush has everything you want in a quality detail brush and much more. The staff and I at Palm Beach Motoring studied all the various brushes on the market and compared their pros and cons. Ultimately I took our wish list for the perfect wheel brush to Dean Henderson at EZ Detail Brush, Inc. Dean had already created the ultimate motorcycle detailing brush with the EZ Detail Brush. With a few modifications, I knew we could create the ultimate auto detail brush. 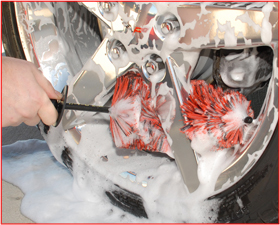 Dean manufactured the Speed Master Wheel Brush to my exact specifications, right down to the hot rod red bristles. In addition, the Speed Master Wheel Brush has a thicker, reinforced stem. It maintains its flexibility but the new stem is more rugged for frequent use on auto wheels. The bristles are slightly feathered on the ends to gently clean delicate wheel finishes, such as coated or plated wheels, without scratching. Soft, nonabrasive 2 inch bristles. 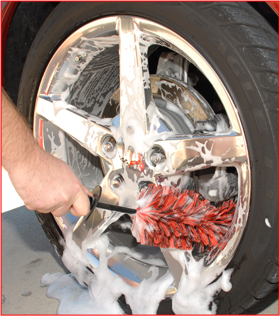 Whether the wheels are aluminum or clear coated, they can be scratched by the wrong brush. The Speed Master Wheel Brush features nylon Nylex bristles that are both flexible and durable. The end of each bristle is feathered to provide an extra gentle touch on delicate wheel finishes. Use the Speed Master Wheel Brush on highly polished aluminum, chrome, stainless, clear coated, and painted wheels with confidence. 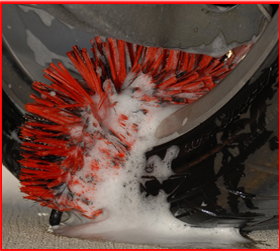 The Speed Master Wheel Brush cleans the entire wheel, front to back. Patented memory bristles regain their shape. Detail brushes can lose their shape and their functionality over time because they’re pressed into the grooves and crevices of your car. The Speed Master Wheel Brush has special memory bristles that regain their shape after every use. Simply rinse the brush in hot water and hang it upside down to dry. The bristles will settle back into their original shape, just like new. Memory bristles allow the Speed Master Wheel Brush to remain effective when other brushes fall short. The patented memory bristles regain their shape after each use. Chemical resistant. The Speed Master Wheel Brush’s synthetic bristles can withstand all wheel cleaners and degreasers, even powerful aluminum wheel cleaners. Whereas natural bristles can eventually become dry and brittle, the bristles on the Speed Master Wheel Brush stay smooth, soft, and flexible. Fits all wheel designs. The Speed Master Wheel Brush may look like a big brush, but it fits in the smallest spaces. Clean between wire spokes and even between the brake caliper and the wheel! The flexible bristles easily fold against the stem to a ½ inch thickness. When you’re finished cleaning the wheels, rinse the Speed Master Wheel Brush in hot water and hang to dry to restore the brush’s original shape. The flexible stem bends around spokes to clean between the wheel and the rotor. Reinforced, flexible stem. Many of today’s wheel designs give you full visibility through the wheel. Brake dust literally has nowhere to hide! The Speed Master Wheel Brush is the solution. The upgraded, vinyl-coated wire stem flexes to reach all the way through the wheel to clean the edge on the other side! The 13 inch stem is of a heavier gauge wire to give it flexibility and stability. The vinyl coating protects the wheel from scratching. In fact, if you pull the bristles apart, you can see that the wire is completely covered for the entire length of the brush. The Speed Master's bristles flatten against the stem, allowing it to clean between the wheel and brake caliper! Safe bonded tip. The tip of the Speed Master Wheel Brush is coated in vinyl to protect the wheel from contact. No part of the internal wire stem is visible so there’s no chance of it scratching the wheel as long as the bonded tip stays in tact. Knuckle guard protects your hands. A rubber guard above the handle helps protect your hands from cleaners or scrapes, because we know you really get into your work. An ergonomic handle makes cleaning comfortable. Clean from one side of the wheel to the other with the 18 inch Speed Master Wheel Brush. Cleans the engine bay, too. The Speed Master Wheel Brush is a phenomenal wheel brush, but it also works great under the hood. The flexible, synthetic bristles, long stem, and go-anywhere design all make it ideal for cleaning between engine components. You can use the Speed Master Wheel Brush on chrome, aluminum, and custom engines. It will not scratch! We highly recommend using a second Speed Master Wheel Brush for the engine to avoid cross-contamination between the wheels and engine. As with any detailing tool, always use an appropriate cleaner for the surface you’re detailing. 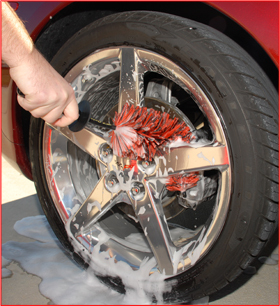 For all wheel types, we recommend a water-based wheel cleaner, such as Pinnacle Clear Coat Safe Wheel Cleaner. This cleaner is highly effective on brake dust but it will not spot the wheel finish. For the best results with the Speed Master Wheel Brush, dip the brush in warm water and then use it to agitate the wheel cleaner. The warm water will make the bristles more pliable to squeeze into those tight spokes. After every use, take a moment to wash the oil and grease from the Speed Master Wheel Brush. You’ll have a clean brush the next time you’re ready to detail. This also gives you the opportunity to rinse the brush in hot water and hang it to dry to reshape the bristles. Brake dust can go anywhere – your wheel brush should be able to as well. The Speed Master Wheel Brush fits where other brushes can’t to thoroughly clean the most intricate wheel designs. The synthetic memory bristles are safe on all wheel finishes, and the brush regains its shape after use. The Speed Master Wheel Brush is the ultimate detail brush for all wheels, including high performance, alloy, spoke, wire spoke, metal, and coated wheels! Licensed by EZ Detail, Inc.